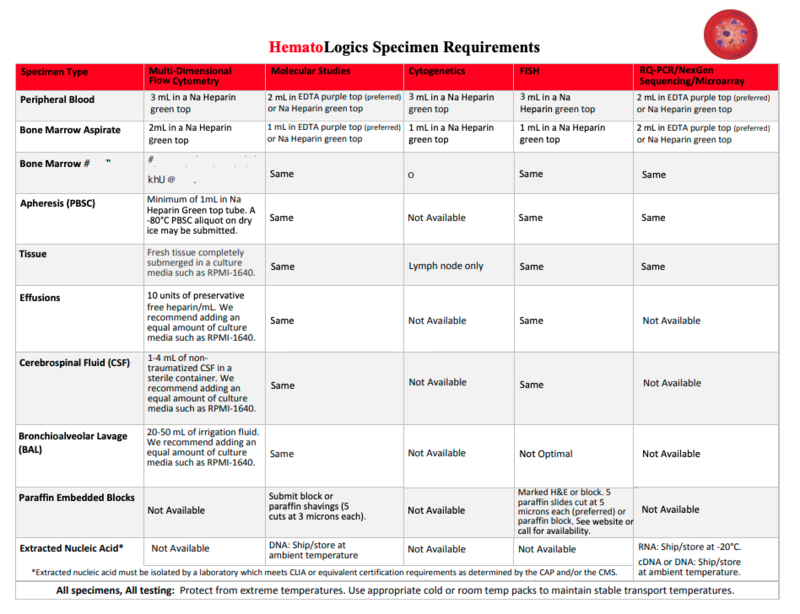 Specimen Requirements | Hematologics, Inc. Sample viability with our type of Flow Cytometry is of the utmost importance. For example, if a shipment is delayed or if a specimen is held overnight, please do not put it in the refrigerator. Instead, add 1:1 RPMI fluid to the specimen and hold overnight at room temperature. We find that under these conditions the specimen stays viable for 4-5 days. We instruct our International Clients to do this protocol all the time. This allows for the cells to get some glucose but yet does not shock them with a cold temperature and contribute to potential erroneous results. Please include a pathologist-marked H&E slide, as well as the pathology report. Note: If possible, the lesional area of interest should be under 22 x 22 mm in size and within 10 serial sections of the provided H&E slide to ensure detection of any abnormalities. Paraffin embedded tissue should be fixed in 10% neutral buffered formalin fixed a minimum of 6 hours. A minimum of 2 unstained slides at 4 microns thickness per FISH probe ordered. Specimen slides should be stored and sent at ambient temperature using overnight shipping. As a general rule when requesting multiple tests, send only one specimen and we will split it for you. Exceptions to this rule include the RQ-PCR assays (listed below) that require larger specimen volumes and may necessitate additional tubes of peripheral blood or bone marrow.